Christo (Javacheff) was born in Gabrovo, Bulgaria, on June 13, 1935, the same day and year as his Moroccan-born wife, Jeanne-Claude. He is an environmental installation artist who has become known for “wrapping” famous buildings and geographical landmarks with plastic and woven-fabric sheets. Aided by his late wife and artistic partner Jeanne-Claude, his temporary art projects typically span great distances in populated landscapes, both rural and urban. Christo’s installations are mostly made of colorful fabrics, created in the form of large curtains, wrapped buildings or bridges, running fences, surrounded islands or coastlines, massive umbrellas, and other assemblages. Our Fine Art Gallery has the finest quality Christo original prints and screenprints for sale. We encourage you to make an appointment to see specific works you are looking to collect. We are happy to meet you at either our art gallery showroom or at your home or office for a private presentation. Christo studied at the Fine Arts Academy in Sofia from 1952 to 1956, and then worked at the Burian Theatre in Prague in 1956. In 1957 Christo left for Western Europe by bribing a railway official and stowing away aboard a train headed for Austria. While in Vienna, Christo enrolled at the Vienna Academy of Fine Arts and the following year Christo went to Paris where he began creating small wrapped, objects such as bottles, packages and barrels. As a result of his flight, Christo lost his Bulgarian citizenship and became a stateless person. Christo’s life in Paris was characterized by financial hardship and social isolation, which was worsened by Christo’s difficulty in learning French. Christo earned money by painting portraits, which he likened to prostitution and signed with his family name “Javacheff” while his early works were signed “Christo”. In 1958 Christo and Jeanne Claude met in Paris when Jeanne-Claude’s mother commissioned a portrait by Christo and invited him home to lunch. At the time Jean-Claude was engaged to another man, and just before her wedding she was impregnated by Christo. Jeanne-Claude left the marriage to be with Christo, and their son, Cyril, was born in 1960. In 1964 Christo and Jeanne-Claude settled in New York City, and Christo gained his US citizenship. Christo displayed his art in several galleries, including the well-known Castelli Gallery in New York and Gallery Schmela in Dusseldorf, Germany. Christo began to create Store Fronts which he built to scale. The sale of the Store Fronts helped finance larger projects. In 1969 Christo and Jeanne-Claude wrapped the coast of Little Bay in Sydney, Australia with the aid of 130 workers who devoted 17,000 work hours. After initial resistance from the authorities and the public, reactions were largely positive. Throughout the 1970’s and 80’s Christo and Jeanne-Claude financed numerous wrapped monument installation projects all over the world including: Valley Curtain 1971 (Rocky Mountains), Running Fence 1976 (California), Surrounded Islands 1983 (Biscayne Bay, Miami), Point Neuf 1985 (Paris). In 1991 Christo and Jeanne-Claude financed a monumental bi-national installation project. The plan was to have yellow umbrellas set up in California and blue umbrellas in Japan at the same time. The total cost of the project was $26 US million. In total, 3 million people saw the umbrellas, each measuring 6 meters in height and 8.66 meters in diameter. In 2005 Christo and Jeanne-Claude began the installation of a project Christo had conceived in 1979. The Gates in Central Park was open to the public for two weeks, and a total of 7,503 gates made of saffron color fabric were placed on paths throughout Central Park in New York City. They were five meters high and had a combined length of 37 km. The cost of the The Gates was $21 US million, which was raised entirely by Christo selling studies, drawings, and collages. 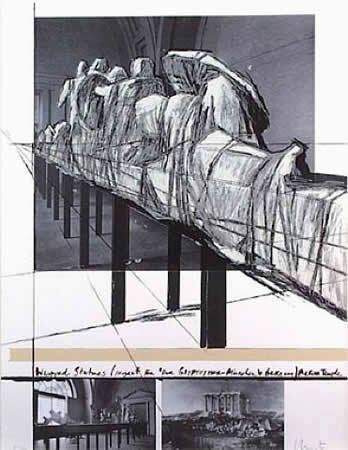 The Christo and Jeanne-Claude paid all expenses associated with the installations, including planning, construction, and tear down, partly from the sale of Christo’s preliminary drawings, lithographs, and collages of his early works from the 1950’s and 1960’s. Christo accepts no contributions, grants or other financial assistance, preferring to make their aesthetic decisions apart from any influence financial backing might involve. A large group of paid workers is necessary to construct, dismantle and eventually recycle the artworks. Usually, there are years of planning, meetings and hearings held by governments and communities, to gain approval for their projects. Jeanne-Claude died in New York City on November 18, 2009, from complications due to a brain aneurysm. Her body was to be donated to science, one of her wishes. Christo is still continuing to plan and finance their many projects that have yet to come to fruition.